How Many Calories Are Tortilla Chips & Salsa Dip? 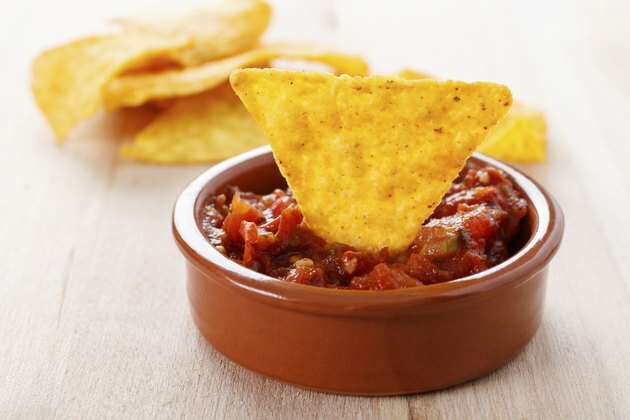 According to "Fitness" magazine, dipping tortilla chips in salsa can provide you with a full serving of vegetables. Keep portion size moderate, because tortilla chips are high in sodium. Tortilla chips are made from corn tortillas that are fried and cut into wedges. While salsa originally referred to a specific combination of tomatoes, onions, cilantro and spice from chili peppers, it's now served with various ingredients, according to MSNBC. Examples include black beans, cucumber, lime, mango, avocado, pineapple or corn. Ten tortilla chips provide 146 calories, according to the FatSecret website. Two tablespoons of salsa add 9 calories. Salsa provides several antioxidants, natural phytochemicals and potassium, according to MSNBC. Salsa is also a good source of fiber, vitamin A, vitamin E, vitamin K, vitamin B6, copper and manganese. "Fitness" suggests choosing baked tortilla chips. To keep portion size under control, eat chips from a bowl instead of the bag. Make your own salsa so you can limit salt.